Healing Arts Veterinary Center takes pride in giving back to our community. We have provided free medical care and housing for special needs pets and helped place pets in new homes. We are extremely pleased to announce that Coco has been ADOPTED! We could not be more thrilled that she has finally found her forever home with such a kind and loving family. She now has a great yard, kids to play with, and even a puppy sister! Thank you to everyone that inquired about her. Hooray for a happy ending! Coco is an energetic one year old “Shorkie” (Yorkshire Terrier/Shih Tzu Mix) that first came to our facility as an 8 week old for puppy vaccines. Throughout the first year of her life, Coco was an active member of our day care and boarding services. However, during a walk with her owner in late April, she was frightened and ran into the street where she was struck and dragged several yards by an SUV. The end result, sadly, was two broken legs and extensive damage to the skin over her back legs. Coco was rushed to Healing Arts Veterinary Center. Coco’s owners were unable to cover the full cost of the surgeries and the time necessary for daily wound care. Healing Arts agreed to cover any overage and has cared for her since the accident. Following two extensive surgeries at a specialty center and a great deal of rehabilitation with us, Coco is nearly 100%. Other than a slight limp, which is continuing to improve, there is no evidence of her severe injuries. Laura Bush is a 4 year old beagle that has found her way back home, Healing Arts Veterinary Center. Adopted on President's Day, "Laura Bush" is aptly named. She quickly filled a void in the hearts of one of our long time clients that had lost their previous pet to cancer. She later became a star in our commercials. Unfortunately, due to their newly born son's severe allergies, the owners were forced to surrender her. While at a local shelter, she was attacked by another dog and became paralyzed in her hind legs. The shelter, looking for previous medical history, contacted us. Immediately, Drs Sharpe and Gorgevska knew what had to be done. "Laura Bush" was one of our own and needed care. We asked the shelter to bring her to Healing Arts so that we could try to improve her condition and find her a suitable home. She arrived on 12/16/2010, eleven days after the attack. A treatment protocol of therapeutic laser therapy and range of motion exercises were started right away. Incredibly, "Laura Bush" began to improve. Each day she worked harder, trying to stand and walk. By the first of the year, she was standing on her own and walking short distances. The treatments started to include the underwater treadmill. Everyday she continues to improve and get better. "Laura Bush" is an incredible dog and will be looking for a home soon. Until then the doctors and staff of Healing Arts Veterinary Center will continue to work their magic. All of the care, treatments, medication, laboratory work, etc has been provided by the staff and doctors of Healing Arts Veterinary Center at their expense. Laura has been in her forever home for over a month.. She and her Beagle brother are getting along great and she seems to be enjoying being back in a home setting. We will be seeing her regularly for her physical therapy sessions. When "Zora" first came to us in August of 2010, she was a 5 week-old bundle of energy and personality. She was one of a litter of feral kittens that had been born on the property of one of our clients. He knew from the moment she first came romping over to say "Hi!" and chew on his shoe that she was special. One day he noticed that she was limping and made an appointment to bring her to Healing ARTS Veterinary Center to have her examined. We found that "Zora" had suffered an injury to her rear right paw. 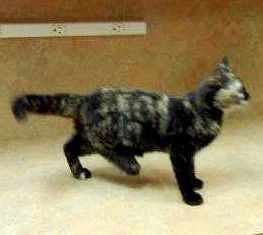 She had either been caught in a trap or attacked by a larger animal and had lost the bottom third of her right rear leg. Because she was still able to walk, the doctors wanted to hold off on surgery. They felt that, through physical therapy and treating the wound on her leg, she would be able to lead a normal and healthy life. Unfortunately, this gentleman had limited resources and wouldn't be able to afford either the physical therapy and wound treatments or the surgery to amputate the leg, should it be necessary. Dr. Sharpe and Dr. Gorgevska discussed it and decided to have the kitten signed over to our hospital. They knew that, once "Zora" was ready, they could find a good home for her. And so, "Zora" came to stay with us. Despite daily bandage changes and getting medicine twice a day, her attitude was always good. She would sit patiently while the technician cleaned and dressed her wound. "Zora" could usually be found frolicking around the Isolation Ward after closing with our receptionist, Candice. Her favorite thing to play with?, the plastic bag in the garbage pail. After several months of medical care, "Zora" was healthy enough to find a home. Needless to say, several members of the staff were ready and willing to make her a part of their family. "Zora" was officially adopted on December 1st, 2010. The doctors feel that, because she continues to do well and the wound on her leg has healed completely, amputation won't be necessary. We here at Healing ARTS Veterinary Center are so glad that we were able to give "Zora" a second chance and look forward to watching her grow and thrive in her new home. Speduce was surrendered to our office by his owner when they could no longer care for him. Speduce is a 3 year old neutered, male Hairless Chinese Crested. He is very sweet, a little shy around new dogs, and always ready to jump into a lap. We were able to find him a loving family where he got along with his new canine siblings. 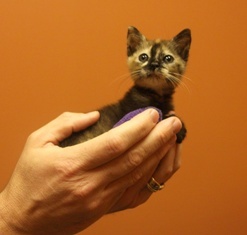 Luna was found wandering on a busy street by one of our clients. 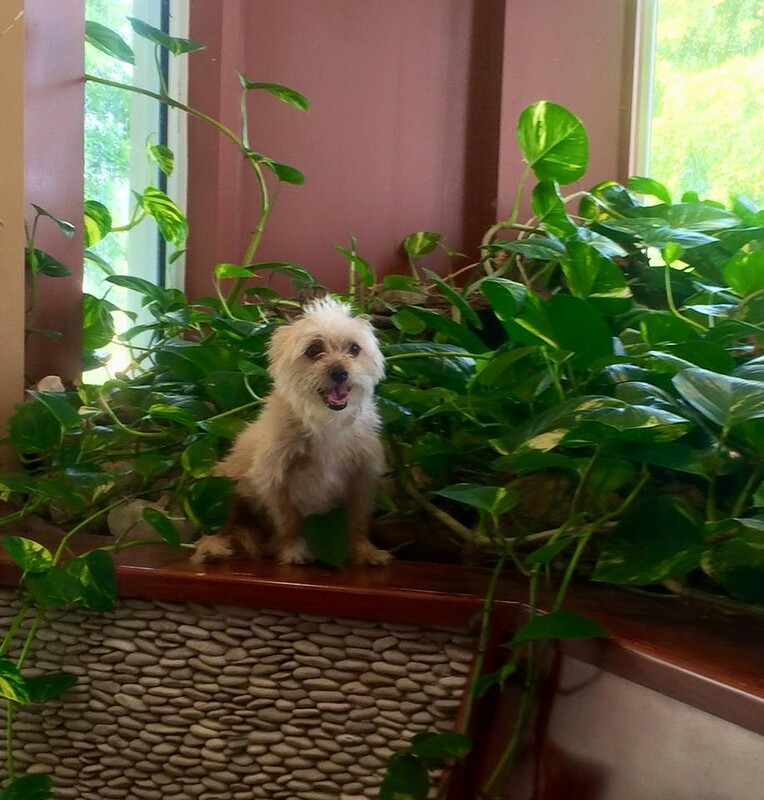 We took her in and began the search for her owner. After a week, no one responded to our posts on our website, Facebook or the Palm Beach Post. 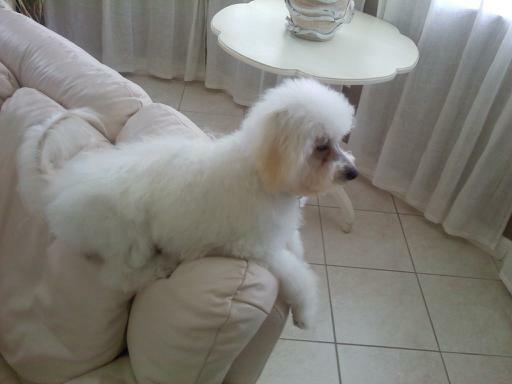 This little dog was a matted mess and needed grooming, treatment for fleas and parasites. Her blood tests showed her to be in good shape otherwise so we took care of her vaccines next. Out of curiousity, we ran a Wisdom Genetic Panel and found out that she is mostly Poodle with a little bit of Shih Tzu. Our doctors and their kids fell in love with her so she became a part of their family. She spends her days running through the house and yard with her canine brothers, Ovechkin and Pawvel, or on someone's lap.